If you’re look for a sure-fire way to make a statement at your next party, then make Jello shots with liquor. No longer just for the college crowd, Food & Wine magazine reports that these tasty treats are taking center stage in fancy Manhattan restaurants and sophisticated at-home soirees alike, and its editors have even created a recipe for a haute Jello shot with bacon and maple syrup. Whether you go classy or you go classic, it’s easy to make Jello shots with at home—and your guests are sure to thank you for it. Before you make your Jello shots with liquor, make sure your cups are ready. You can purchase paper or plastic cups specifically designed for Jello shots at many party stores. 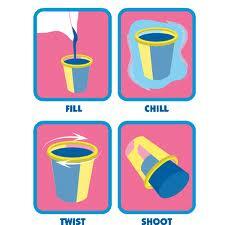 You can also buy a package of small paper cups and cut off the tops, leaving a 1-2 inch base to hold your shots.